Do you have clear financial goals? Setting goals for what you want to achieve with your money can give you an actionable plan to follow and a reason to stay motivated. But which financial goals are most important for achieving in life? As you plan your financial bucket list, consider including these lofty financial aspirations. Live Within Your Means: Living within your means simply means that you don't spend more than what you earn each month. This may seem like a relatively small target to include on your financial goals list but it can have huge implications for your finances. When you live within your means, following a budget each month, you don't overspend. When you don't overspend, you don't incur a load of debt. When you're not bogged down with debt payments each month, you have money that you can use to pursue your other life and financial goals. Aim for Excellent Credit: Your credit score is more than a three-digit number; it's an important measure of your financial health. A perfect 850 credit score may seem elusive but getting your score above the 800-mark can still yield valuable benefits. The higher your credit score, the easier it is to get approved for loans. More importantly, a higher credit score translates to lower interest rates when you borrow. That can result in lower monthly payments for loans and allow you to pay less in interest over the life of the loan. Pay all your bills on time each month, with no exceptions. Use a mix of credit cards and loans. Be Prepared for Financial Emergencies: Even if you live on a budget and carry a low amount of debt, you can't always anticipate life's twists and turns. When an illness or injury leaves you unable to work in the short-term or you get into a car accident and need to pay for repairs, your emergency fund can save the day. Having at least six months' worth of expenses in a high-yield savings account, money market account or certificate of deposit is a good number to aim for. If you're feeling more ambitious or you want to be prepared for any financial emergency, large or small, you may want to increase that to nine or 12 months' worth of savings. 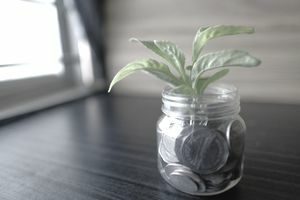 Fully Maximize Retirement Plan Contributions: The sooner you begin saving for retirement the better, as you have more time to take advantage of the power of compounding interest. You can get even more juice from your retirement savings accounts by making contributions up to the full limit allowed each year. As you plan your financial goals, consider which retirement account you'd like to max out first if you have both an individual retirement account and a 401(k) or similar plan through your employer. If you can fully fund a traditional or Roth IRA in January without depleting your emergency savings, you may want to do that, then focus on maxing out your 401(k) contributions the rest of the year. Alternately, you could fund your 401(k) first, then set your sights on an IRA. A good way to plan contributions is to divide the annual contribution limit for each account by 12, then add the two together. That can tell you how much you'd need to set aside each month for retirement. Remember, that after age 50 you're allowed additional contributions to both 401(k)s and IRAs. Help Your Kids Avoid the Student Loan Squeeze: Student loan debt has reached epic proportions in the U.S. as college tuition prices climb higher and higher. If you used student loans to pay your way through school, you may want to help your children avoid that debt burden. Similar to planning for retirement, the best way to achieve this financial goal is starting early. But even if you're starting later, you can still help your kids go to school with minimal debt by saving in a 529 college savings account. A 529 plan offers the benefit of tax-free growth, coupled with tax-free withdrawals when the money is used to pay for qualified education expenses. And it's not just parents who can contribute to a 529; you could also ask your children's grandparents to make contributions. Remember, however, that contributions to a 529 plan may trigger the gift tax if you exceed the annual exclusion limit. Enter Retirement Mortgage-Debt Free: Once you've prioritized your retirement savings and planning for college, consider whether paying off your mortgage belongs on your financial goals list. Accelerating your mortgage payoff can help you reduce expenses going into retirement, allowing the money you've saved to stretch even further. Review your time frame for getting your mortgage paid off, then use a mortgage calculator to determine how much extra you'd need to pay each year to meet the deadline. And run the numbers carefully if you're thinking of refinancing. Refinancing could result in a lower rate but unless you refinance to a shorter mortgage term, you could end up paying more in interest over the life of the loan. Create Your Financial Legacy: If you're saving consistently and paying off debt, chances are you'll have accumulated some real wealth by the time you reach retirement. The question you have to ask yourself is, what will happen to it once you're gone? You may want to pass on some or all of your wealth to your children or grandchildren; alternately, you may want to establish a legacy of charitable giving. Thinking about what you would like to do ahead of time can ensure that your wishes are carried out, and it affords an opportunity to do some tax-efficient planning so that there's more of your wealth to go around. As you plan your financial goals, remember to consider where each of these priorities fit into the picture. And, talk to your financial advisor about how you can go about making these goals a reality.